Free Hero Rotation (Oct.6): Try Taka, Celeste, Krul & More! 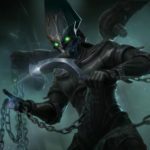 NA VGL Bracket Challenge: Up to 20K ICE Grand Prize! Phinn will be unlockable with ICE only for the first 7 days. Afterward, you will be able to unlock Phinn with ICE or Glory. Phinn throws his anchor in a direction. After the anchor reaches its destination he yanks it back, damaging all enemies in its path and pulling them back to him. If Phinn doesn’t pull any enemies, a percentage of the cooldown is refunded. 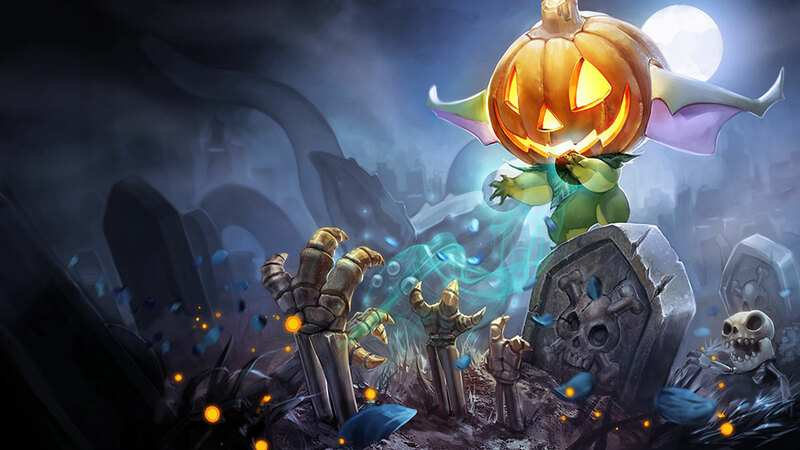 Play on a seasonal version of the Halcyon Fold, complete with carved pumpkins, gravestones, altered Minion Mines and more. Be sure to toggle on “pinch to zoom” in Settings so you can explore all the map’s secrets! 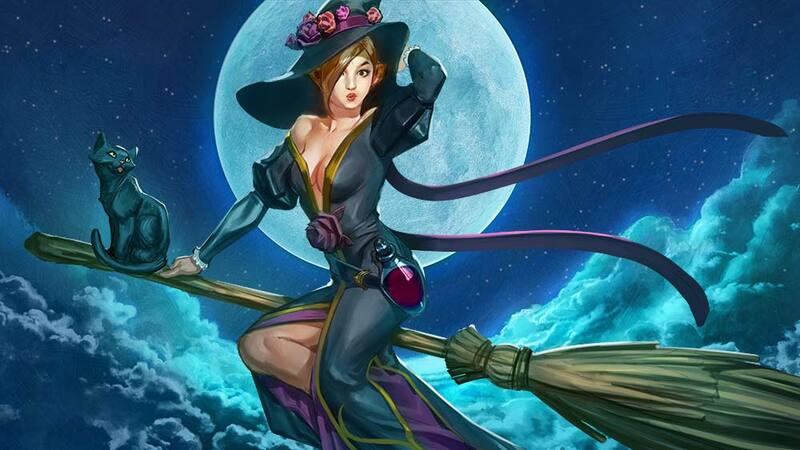 Unlock the limited-edition Baewitched Celeste in the Market in update 1.9 only. This special skin will be removed from the Market around Halloween and afterward there will be no way to get it! Once unlocked, the skin is yours to keep — even after it leaves the Market. Limited-edition seasonal skins do not have tiers or cards and must be unlocked with ICE before they’re gone. Unlock the limited-edition Pumpkin Spice Petal in the Market in update 1.9 only. This special skin will be removed from the Market around Halloween and afterward there will be no way to get it! Autumn 2015 is our first season, which will last from now until early January. All players have three months to earn the highest possible skill tier and other achievements to fill their Autumn 2015 trophy room. 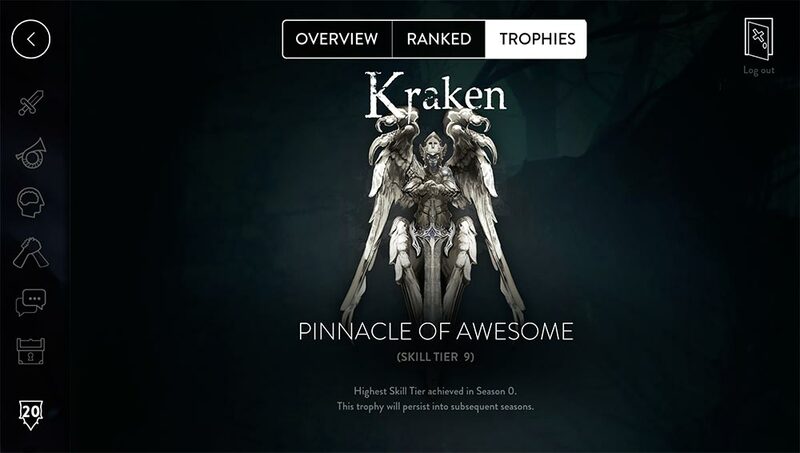 At the end of the season, the Autumn trophy will be added to your Vainglory profile. But play without fear! The best skill tier you achieve in 1.9 will be immortalized; it doesn’t matter if you drop down during the season. Your Season 0 (preseason) skill tier trophy has been immortalized in your Trophy Room. Congratulations! That can never be taken away from you. Your existing skill tier has been archived. Your starting skill tier for Autumn will be different than where you ended the preseason based on a “compression” of tiers, giving you room to rank up during Autumn 2015. Play Ranked matches now to earn your Autumn trophy and prepare for future rewards. The compression clears out a lot of noise in the system from players who ranked up when the meta was very different or when Skaarf was OP burning down whole villages, etc. If you felt “stuck” before, you’ll have an even playing field and ample room to climb — eventually ideally climbing above your best Season 0 rank. Update 1.9 introduces teams and guilds, and getting a fresh start every season will be essential to earning special rewards and accolades — or even for qualifying for big Vainglory events and tournaments. Mark your calendars for Autumn Vainglory eSports! Read all the details here and look out for announcements throughout the seasons. As an extra seasonal gift, we’re giving all iOS players a free Celeste unlock and all new Android players a free Taka unlock during October! To get your free unlock(s), all you have to do is log in and play sometime in October. We’ll take care of the rest. 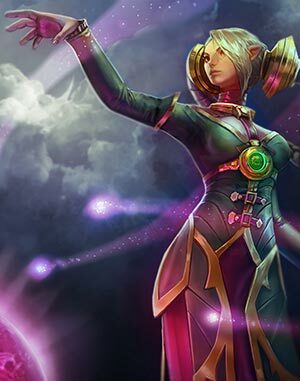 From there, pick up a Baewitched Celeste or a Shiro Kage Taka skin and you’ll be looking good with your new, top-tier hero! “Vainglory is more fun and more rewarding when you play with friends. You can relive epic matches, plan hero comps, discuss strategies and best of all, no AFKs! But not everyone has a go-to group of players they can rely on. That’s why we’re introducing guilds. These are fun, social destinations in-game filled with likeminded players. Together, you’ll play and push for seasonal rewards based entirely on dedication and participation. So, it doesn’t matter if you’re Vainglorious or just learning; anyone can contribute to the guild in meaningful ways, and no type of player will hold you back. In fact, the more the merrier, as the more active players you have, the more likely you’ll be able to hit special guild-only seasonal goals and rewards. Your guild will also have a unique name and guild tag displayed in-game when you play with guildmates. “You can informally give your guild any focus you like, whether that’s based on locality, skill tier or interests — and you can explicitly set your guild to an open-door policy where everyone is welcome or invite-only to ensure the guild retains your priorities. It costs a small amount of ICE or Glory to create a guild to guarantee they are legitimate and run by dedicated players. 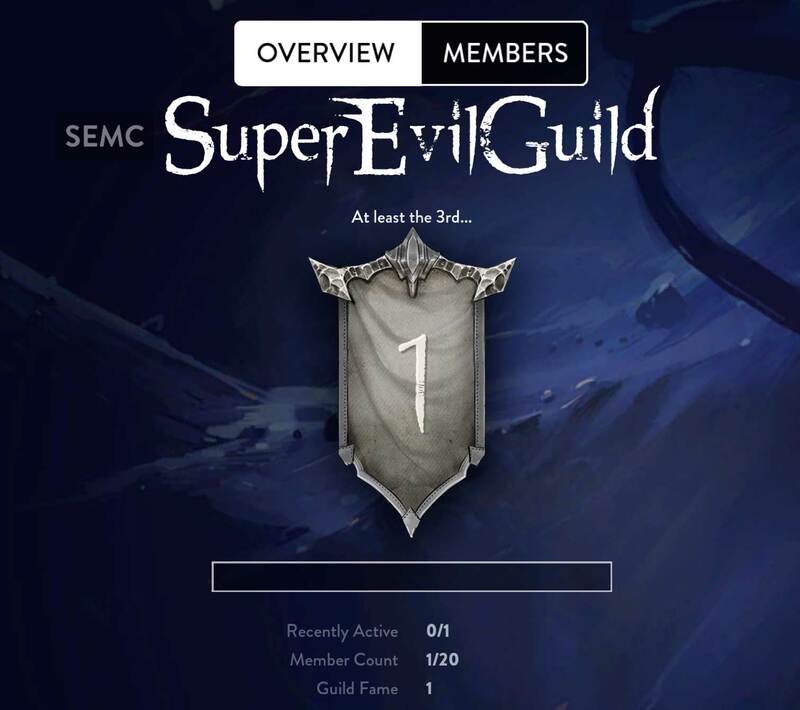 In the beginning, guilds can include up to 20 members. By being active, guilds can unlock the ability to add up to 50 members. Create or join one guild, which contains up to 20 players (can expand to 50 players). All members must be in the same server region. Guilds will have special rewards based on dedication and participation. Earn Guild Fame, which will unlock the ability to add more guild members and do much more over time. Each guild has its own in-game overview with art, statistics and other information. Each guild has its own dedicated text chat channel that appears above common friends. Your Friends and Party lists will prioritize guildmates. Note: You do not need to be in-game friends with a guildmate to see them on your list. This is just the beginning for in-game guilds. We will build on this 1.9 foundation and add much more awesome for guilds to rally around in the future. Leader: Granted to the player that created the guild and recognized by a crown next to the leader’s name. There can only be one. This role is transferred to the longest-serving member if the leader leaves the guild. Veteran: Granted to players who are very active and dedicated to the guild. Players obtain the Veteran status after 30 Guild games. Veterans may invite other players to the guild in invite-only guilds. Member: Standard rank for all other members. Players obtain member status after 10-30 guild games. 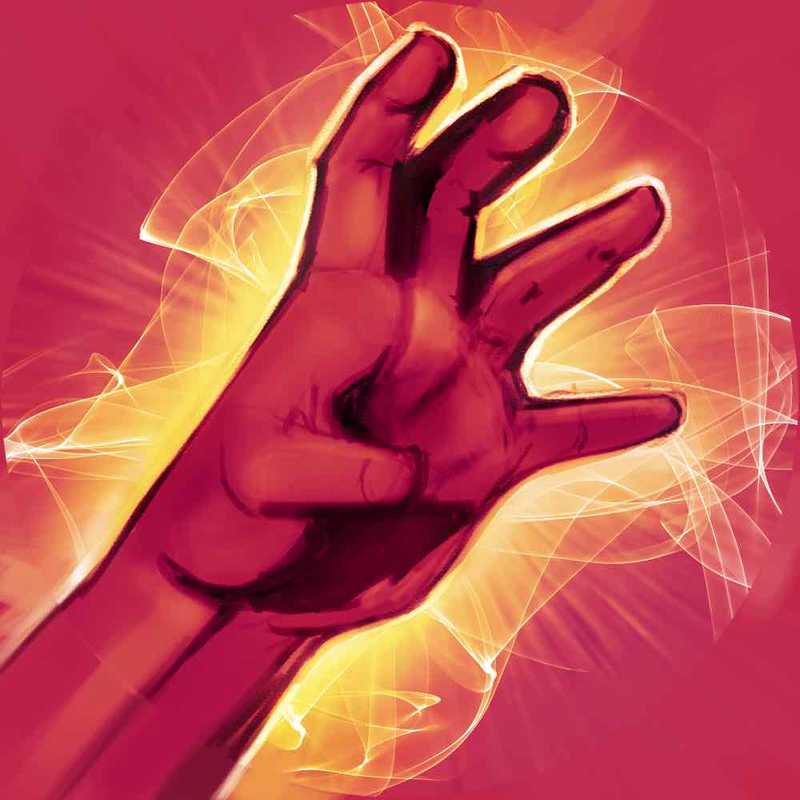 Initiate: The rank new members get when joining the guild. Players keep this rank as long as they have played fewer than 10 guild games. 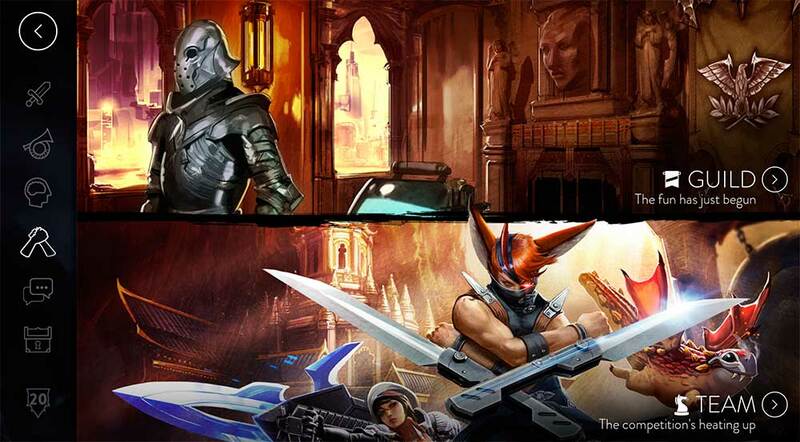 “The Vainglory competitive scene has advanced far faster than we ever anticipated. From massive March Madness-style 128-team VGL tournaments to the Vainglory International Premier League (VIPL) live in Seoul on Korean TV to big-name organizations forming pro Vainglory teams, this is getting very real, very fast. To support the rapid expansion of Vainglory eSports and give every Vainglory player — regardless of skill tier — a taste of the fame and glory, we’re formalizing teams within the game. “These teams of up to six players can push for competition-based and win-based rewards no matter what their skill level. That said, the new team skill tier will be used to qualify teams from in-game to actual big tournaments with sizable prize pools, and your team ranking will also help determine your seeding within those tournaments. So, playing and training as a formal team will be essential, whether you’re the world champion GankStars Sirius or a brand-new team with a faint dream of playing under the bright lights. Create or join one team, which contains up to six players. 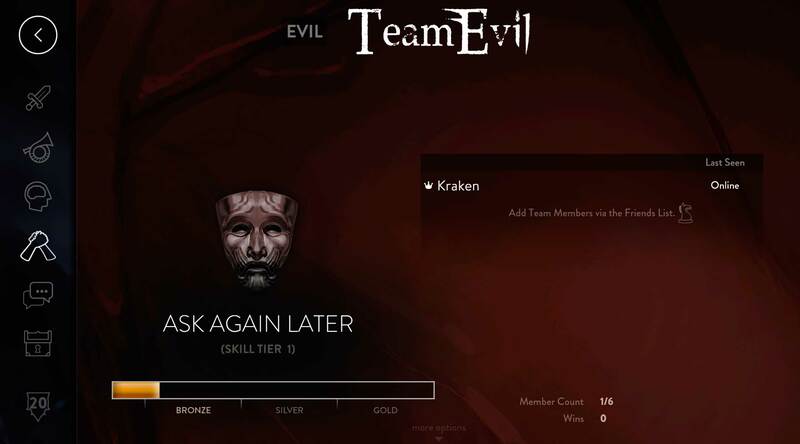 All team members must be in the same server region. Teams will have special rewards based on competition & wins — and your team skill tier will qualify teams for major tournaments and help determine their seeding. Each team has its own dedicated text chat channel that appears above common friends for easier communication and strategizing. Each team has its own in-game overview with art, statistics and other information. Your Friends and Party lists will prioritize teammates. Note: You do not need to be in-game friends with a teammate to see them on your list. This update lays the early foundation for in-game teams, but our competitive vision is too expansive to fit in a single update. It all starts here, but if you have a well-established team in future updates, you will be well rewarded with opportunity and prestige. Turrets no longer gain 300-520 armor & shield when no minions are nearby. Percent max health damage down from 7.5% to 5% (was 4.5%). Damage amplification per shot down from 45% to 30% (was 28%). Turrets constantly regenerate a 300 HP barrier per second; max 600 HP. However, as soon as a turret is in combat with minions or Kraken, this barrier is disabled for 3 seconds. Minions no longer shred turret-defense stats. Maximum-strength minions are ~15% tankier. 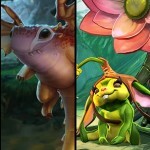 Petal controls three ‘munion’ pets. A few moments after Petal plants a seed, it will automatically sprout a munion, up to a maximum of 3 pets. In addition, basic attacks mark enemy heroes with sunlight. If a munion bites a marked target, the sunlight is consumed and Petal gains 10-40% attack speed (level 1-12) for 1.5 seconds. Petal plants a Brambleboom seed directly in front of her. Seeds near Petal will sprout into pets after a brief delay, up to 3 pets. Seeds that remain on the ground provide a small healing and defensive aura to allies. Seeds have a small vision radius and survive for 20 seconds or until Petal leaves the area. If an enemy steps on a seed, the seed explodes and knocks the enemy back. Petal stores up to 6 seeds as charges, gaining a seed every few seconds. Activate when standing on a boom seed to trampoline off it and launch forward in Petal’s facing direction. Using this ability will rally all pets back to Petal’s location. Petal commands her pets to explode one by one, dealing massive splash damage on. Pets are invincible during channeling. Detonated pets become seeds. Basic attack range down from 7.0 to 6.0. Weapon power down from 70-140 to 64-134. Basic attack speed down from 100-111% to 100% at all levels. Munions now automatically spawn from seeds after a 2.2-second delay (as long as Petal is nearby). Munions have 2-2-3-3-4 ticks of health. Damage changed from 8-63 + 40% crystal ratio to 7-47 + 50% crystal ratio. Gold bounty down from 10 to 2. Seeds have 2-2-2-2-3 ticks of health. Overdrive: Increases minion damage crystal ratio by 10% crystal ratio. Cooldown accelerated from 96-91-86 to 90-80-70. Duration up from 4-6 seconds to 6 secs at all ranks. Attack speed boost up from 55-86% to 55-64-73-82-100%. Basic attack range increased from 5 to 5.5. Basic attack speed increased from 100-117% to 100-136%. Movement speed bonus triggered upon Target Lock (first application). Cooldown is reset when activating Suri Strike. Crystal ratio down from 240% to 210%. Maximum duration of barrage down from 4 seconds to 3 secs. Cooldown down from 6 to 6-6-6-6-5. No longer deals reduced damage to non-heroes. Cooldown down from 18-16-14-12-8 to 13-11.5-10-8.5-6. Removes animation lock at the end of the ability. Missiles no longer lead their target but instead fire in a line from the target’s location to where Skye dashes to. Missile AOE increased from 1.7 to 2.2. Damage per second up from 200-300-400 to 275-350-425. Crystal ratio up from 150% to 190%. Weapon ratio down from 100% to 70% (both 1st and 2nd hit). Second-hit crystal ratio down from 150% to 120%. Resonance bolts do not emit toward targets that are Reflex Blocking. Overdrive: Vox’s basic attacks gain an additional 20% weapon ratio for 2 seconds after this ability is activated. Cooldown increased from 80-55-30 to 90-65-40. Silence moved to initial line nuke; duration down from 1.5 to 0.7 seconds. No longer grants lifesteal on Mortal Strike. Heals for 25-30-35-40-70 + 25% crystal ratio health per second during invisibility. Teleporting home will cancel invisibility. Ki stacks granted down from 3-3-3 to 1-2-3. Energy cost down from 50-58-66-74-82 to 35-41-47-53-59. Base damage down from 225-350-475 to 150-225-300. Damage from stacks is unchanged (160-280-400 @ 20 stacks). Base damage crystal ratio up from 30% to 110%. Crystal ratio per stack up from 1.5% to 2%. Burning goop pools now ignite nearby non-burning goop pools. Cooldown down from 13 to 13-13-13-13-12. Stun duration changed from 0.75-0.90-1.05-1.20-1.75 to 0.8-0.9-1.0-1.1-1.4. Damage increased from 35-37-39-41-83 to 35-45-55-65-90 + 50% crystal ratio. Overdrive: Damage reflected by this ability is increased by 25%. Heliogenesis minion damage down from 120-240 + 25% crystal ratio to 120-200 + 20% crystal ratio. Goop Pool damage over time deals 50% damage to minions. TO 20-60 weapon, 8-24% speed, 10-30 defense based on your level. TO 20-60 crystal, 12-36% CDA, 10-30 defense based on your level. No target can take more than one Stormguard Banner’s worth of damage per second, even if multiple players with Stormguard Banner are hitting it. Fixed a bug where Frostburn was not scaling with crystal (was always at 20%). Changed from 20-40% to 10-35% (but 100 CP from Frostburn instantly takes it to 20%). Max slow down from 40% to 35%. Piercing down from 10% to 8%. Broken Myth only gains stacks on enemy heroes (not Kraken or turrets). Damage amplification changed from 30% over 3 seconds to 36% over 6 seconds. Only requires 1GB RAM (improved from 2GB). Only requires dual-core, 1Ghz devices (instead quad core). Fixed various UI bugs with Party Mode. Fixed co-op dodgers not getting punished. Fixed match dodge punishment sometimes not working in Hero Select. Fixed issues with Karma being affected by non-public matches and matches with friends. Also now allow friends to give each other thumbs-ups.